The Piloting Utility Modeling Applications (PUMA) project is a first-of-its-kind climate adaptation effort spearheaded bymembers of the Water Utility Climate Alliance (WUCA), a coalition of ten of the nation’s largest water providers, including the Pacific Northwest’s Portland Water Bureau (PWB) and Seattle Public Utilities (SPU). PUMA has a simple but ambitious goal: help municipal water providers plan for climate change by putting climate science into action at the local level. CIRC participated in national PUMA/WUCA activities over a period of years, as well as two research projects in the region. Both PWB and SPU had PUMA projects, partnering with CIRC to help them understand how climate changes—from a loss of snow to wildfires—might affect their ability to provide water to their customers. CIRC’s PUMA participants, made up of hydrologic and atmospheric scientists, aided teams of engineers at the two water providers by furnishing them with climate and hydrologic data tailored for their watersheds. Through this effort, we discovered that our CIRC researchers and the utilities’ engineers spoke very different technical languages. But working together, our NOAA RISA team and the PWB and SPU teams figured out how to overcome this obstacle. The result: both utilities are now incorporating climate change science into both their short- and long-term planning and have achieved greater internal capacity for adapting to climate change. Vogel, Jason M., Joel B. Smith, Megan O’Grady, Paul Fleming, Kavita Heyn, Alison Adams, Don Pierson, Keely Brooks, and David Behar. 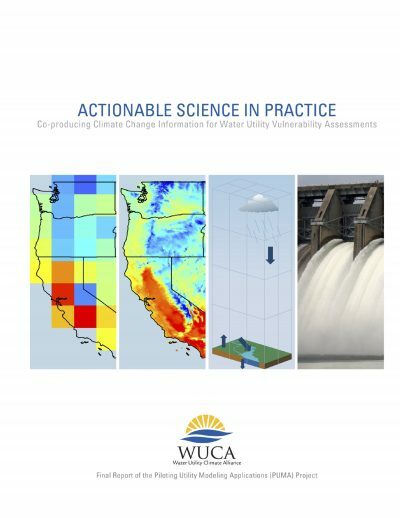 Actionable Science in Practice: Co-producing Climate Change Information for Water Utility Vulnerability Assessments. Final Report of the Piloting Utility Modeling Applications (PUMA) Project. Water Utility Climate Alliance, 2015. Multiple approaches were needed and “one size did not fit all” from utility to utility (Vogel et al. 2015). Both the scientists and utility-managers working on this effort learned to view the project’s process as a “two-way street”that prized open communication (Vogel et al. 2015). Understanding local hydrology and the internal working at the utility level were critical for success (Vogel et al. 2015). Aided the Pacific Northwest’s two largest water utilities, Seattle Public Utilities and Portland Water Bureau, in developing in-house capacity for their own climate research, and in applying climate data to their watersheds in an effort to help theutilities, with over two million customers, respond to climate change impacts to their water supplies. Both Seattle Public Utilities and the Portland Water Bureau are developing adaptation strategies based on our NOAA RISA Team’s input. CIRC has earned significant goodwill and interest in the region due to the success of this project. Applied results from the climate model evaluation study that was part of the Integrated Scenarios project and used downscaled climate data from the MACA dataset. Vogel, Jason M., Joel B. Smith, Megan O’Grady, Paul Fleming, Kavita Heyn, Alison Adams, Don Pierson, Keely Brooks, and David Behar. Actionable Science in Practice: Co-producing Climate Change Information for Water Utility Vulnerability Assessments. Final Report of the Piloting Utility Modeling Applications (PUMA) Project. Water Utility Climate Alliance, 2015. http://www.wucaonline.org/assets/pdf/pubs-puma-white-paper-20150427.pdf. Photography copyrighted by Dudley Chelton.